Marble. Copy from the beginning of the 1st century CE after an original from 30—17 BCE. 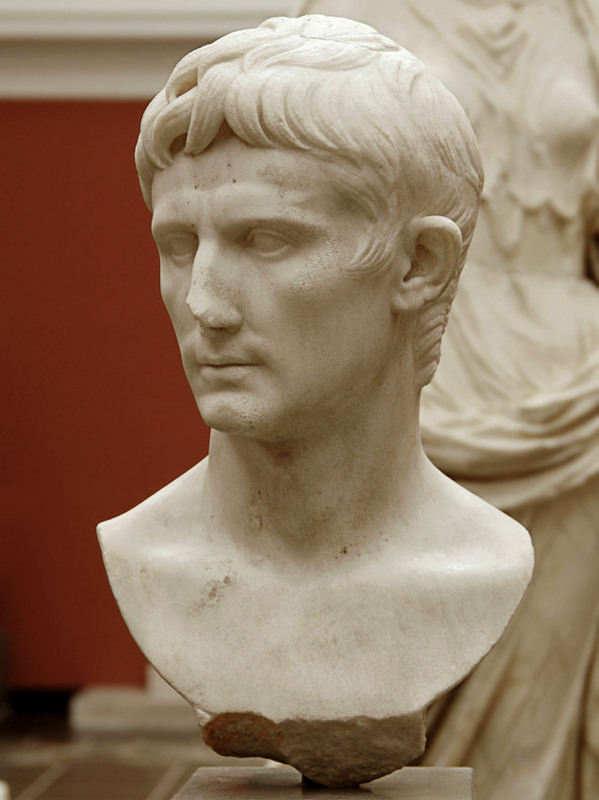 Augustus Caesar (emperor 27 B.C.—14 A.D.) can be recognized from his wide forehead, the locks of hair over his brow, the somewhat bristling ears, the sharp cheekbones, the deeply hollowed chin and the long hair at the back of his head. The portrait is made after the same original, now lost, as the armoured statue from Prima Porta (at the Vatican in Rome). The two portraits are extremely similar in their execution. The hair over the forehead is arranged with a claw-formed lock over the right eye and a fork-shaped lock over the left. The rest of the hair has been executed in somewhat fainter relief. The head is turned markedly to the right and this portrait thus seems to be more energetic than its counterpart, the Prima Porta statue. The circumstances of the discovery of this portrait — it was found together with a portrait of Tiberius, in the “crown prince” type — offer a dating of 4—14 A.D. for the group of portraits. Original: 20—17 B.C. Copy: Beginning of the 1st cent. A.D. The nose is broken off and it is missing. Otherwise, the portrait is in an extremely good state of preservation. W.H. Gross pointed out (1959) that there are remnants of a column’s cannelure which can be seen on the left lower edge of the bust. The head might, accordingly, have been hewed out from a column. Purchased in 1896 from the Greek-Egyptian art dealer Alexander Dingli, through the mediation of Valdemar Schmidt. The bust is said to have been found in the amphitheater in Fayum, together with the Livia portrait (36) and the Tiberius portrait (45). F. Poulsen 1951, Cat. 610; V. Poulsen 1973, Cat. 32; W. H. Gross, Zur Augustusstatue von Prima Porta, NAKG (1959) 161. K. Vierneisel & P.-Zanker, Die Bildnisse des Augustus, München-Berlin (1979) 53, 5.8; Inan & Alföldi-Rosenbaum, Porträtplastik, 84, n. 2, 142; F. Johansen, MedKøb 40 (1984) 108, fig. 9; K. Fittschen, Die Bildnisse der Augustus (1984), Saeculum Augustum III (1991) 166, Taf. 22.1; B. Schmaltz, RM 93 (1986) Taf. 83.2, 87.1, 90.2; Pollini, Portraiture, 70; Kaiser Augustus und die verlorene Republik (1988) no. 170; J. C. Baity, Quaderni de “La ricerca scientifica”, n. 116 (1988) 42, fig. 4—6; M. Pfanner, JdI 104 (1989) 204, Abb. 22 bd. ; Boschung, Augustus (1993) 194.1, n. 79,82, 2. © 1994 F. Johansen. Catalogue Roman Portraits, vol. I, p. 90, cat. no. 33.